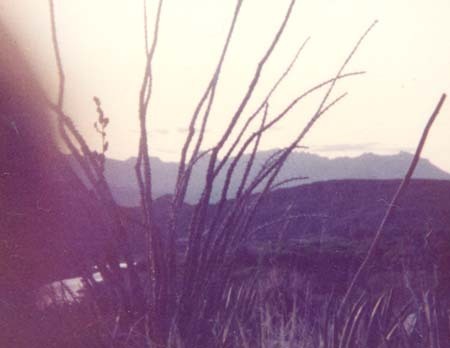 Thursday February 24th, 1983 - We drove to Castellon and camped in Cottonwood Campground in Big Bend National Park. Hiked Burro Mesa pour-off on the way and hiked Santa Ellena Canyon before sunset. Friday February 25th, 1983 - We drove to Ojinaga, Mexico (across from Presidio, TX). The people stared at Beth because they weren't used to seeing women in shorts. We had a good Mexican dinner and got a motel room with hot running water for $6.00. Saturday February 26th, 1983 - We had a wonderful Mexican breakfast before leaving Ojinaga to drive back to the park. We camped in a primitive campsite, Candellia, and enjoyed a beautiful sunset and full moon in desert scenery. Sunday February 27th, 1983 - Michael started work as a volunteer for the forest service, manning the ranger station in the Basin Campground while the rangers were out on patrol, and instructing hikers where to go.